Is Pineapple Juice Acid or Alkaline? May Fredenburg has been writing for publication for more than 30 years. She has covered topics ranging from education, health and nutrition to business and politics. She holds a Bachelor of Science in education and has taken classes in audio engineering and video and film directing and producing. The Alkaline Diet is based on the principle that the human body itself is slightly alkaline and must maintain that alkaline balance to sustain life and that eating primarily alkaline foods helps to maintain that balance -- but it's more complicated than that. According to the "Journal of Environmental and Public Health," the measure of whether a food is acid or alkaline doesn't rely on its pH balance, but on its PRAL score, or how it responds in the body. Therefore, pineapple juice can be considered either acidic or alkaline. Food can be tested for its acid-alkaline balance and measured using a pH scale. On this scale, which ranges from 0 to 14, 0 is the most acid, and 14 the most alkaline; a pH of 7 is neutral. According to the FDA, pineapple juice falls at 3.5 on the pH scale, right in the middle between most acid and neutral, or moderately acidic. In contrast, the fresh fruit itself ranges from 3.5 to 5.2 pH, making pineapple potentially less acidic than its juice. Canned pineapple is equivalent in pH to pineapple juice at 3.5. The PRAL score measures the renal acid loads of various foods; in processing foods the kidneys can produce either more ammonium, or acid, or more bicarbonates, or alkaline substances. A high or acid PRAL score may be implicated in leaching minerals from the bones, which may result in osteoporosis, and might be implicated in the formation of kidney stones, but findings are far from conclusive. 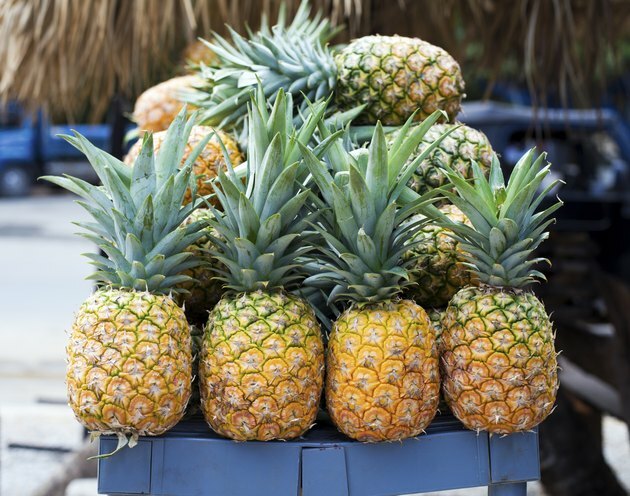 Meats, fish, eggs, dairy and whole grains have a positive, or acid, PRAL score, while fruits and veggies, including pineapple and pineapple juice, have a negative PRAL score, with pineapple coming in at -2.7, or slightly alkaline. National Institutes of Health: The Alkaline Diet: Is There Evidence That an Alkaline pH Diet Benefits Health? Is Rice Acid or Alkaline?